Alternative medicine approach claims that soursop extract can reduce the spread of cancer. There are quite a few animal researches that have proved the medical property of guanabana to cure cancer.1 However, the human studies are still ongoing. People around the world have shown significant improvement in their cancer treatment and for some, the progression of cancer cells is almost stopped after taking Guanabana regularly. In the below paragraphs, we have briefly described how Guanabana works for cancer. What Components Of Guanabana (Soursop) Work Against Cancer? Graviola, guanabana, or soursop whatever you call it, is almost the same. This fruit is prevalent in the rainforests of Africa, South America, and Southeast Asia. Since long alternative practitioners are using soursop fruit and Graviola tree leaves to cure stomach ailments, fever, hypertension, rheumatism, and as a sedative. The fruit, bark, and the leaves of soursop fruit have loads of anticancer, antioxidant, anti-inflammatory, and antimicrobial properties. It is because of these properties it can cure multiple health issues. In one of the phytochemical study, it was found that Guanabana is rich in acetogens. Acetogen is a class of bioactive polyketide-derived constituents which are very powerful anti-cancer agents. This class also has anti-inflammatory and antioxidative properties. Further, the mechanism of action of acetogens against cancer cells is brought about by blocking the nutrition of the cancer cells only. The phytochemicals work to inhibit the complex I that is NADH ubiqunoa oxidoreductase. When this chemical form of energy is blocked, the cells are short of ATP. In absence of ATP, the cancer cells are unable to get energy and food for their survival and eventually they die. Cancer is a deadly disease that can be cured with conventional treatment methods.Guanabana alone cannot cure cancer, but it can surely help to stop its progression and increase the efficacy of the cancer treatment. However, the seeds are not recommended as they might contain toxic compounds so you should always consume the leaves. Prefer drinking soursop tea prepared with the leaves. Drink two to three cups of soursop tea daily for good results. Additionally, prefer consuming the fruit also for added benefits. 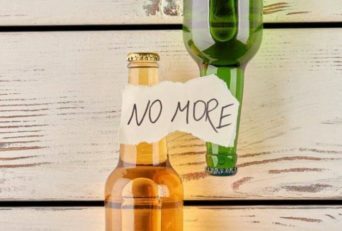 Make sure not to consume too much instead just keep the amount to moderate levels. Over 212 phytochemical constituents of the plant were accessed. The basis of the study was to evaluate the mechanism of action of action of these constituents on the cancer cells. 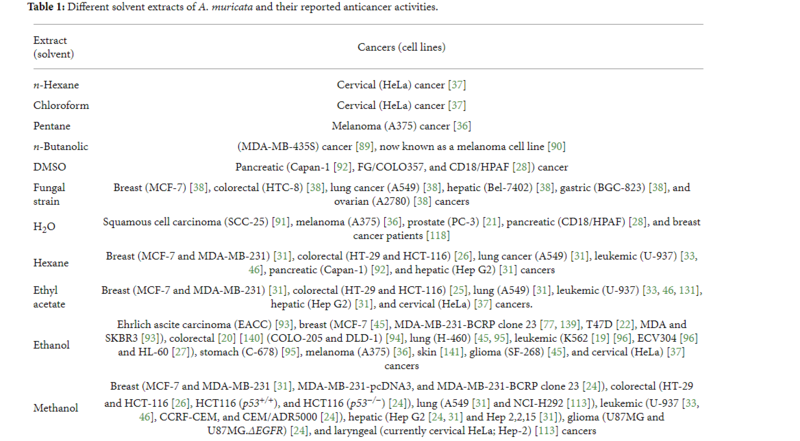 Several phytochemical extracts like n-hexane, chloroform, pentane, hexane, ethanol, methanol, and ethyl acetate were checked for their anti-cancer activities. The outcomes of the study suggested that Acetogenins and other secondary metabolites, including alkaloids present in the soursop plant have the ability to decrease the growth of cancer. Overall, the study concluded with a call for action to manufacture Graviola based pharmaceutical and agricultural product to cure deadly health ailments like cancer. The study was done on 30 outpatients suffering from colorectal cancer. They were divided into two groups. One was the those who were ingested A. muricata leaf extract (n=14) and the second was those who ingested a placebo (n=14) daily for 8 weeks. They were continuously monitored. Ex-vivo and clinical studies on human cell lines showed higher cytotoxicity in the supplemented group than the placebo group. Thus, the study concluded the cytotoxicity levels are raised with daily consumption of A.muricata leaf extract. This study was done against the prostate cancer cell. The aim of the study was to find chemical constituents in Graviola fruit that possess anti-cancer properties. This was done on human cells lines. In this study, the three bioactive compounds C-35 annonaceous acetogenins, muricins M and N, and C-37 annonaceous acetogenins, muricenin were found. All three of them showed potent anti-proliferative activities against human prostate cancer PC-3 cells. The aim of the study was to evaluate the effect of different A.Muricata extracts from different locations. For the study, 19 different samples of Annona muricata froma different location were collected. They were tested by MTT assay on breast cancer cell lines MCF-7, MDA-MB-231, and 4 T1. The study suggested that the cytotoxicity level is different for different cell lines. The most promising effect was of B1 AMCE for cancer treatment, especially in breast cancer. 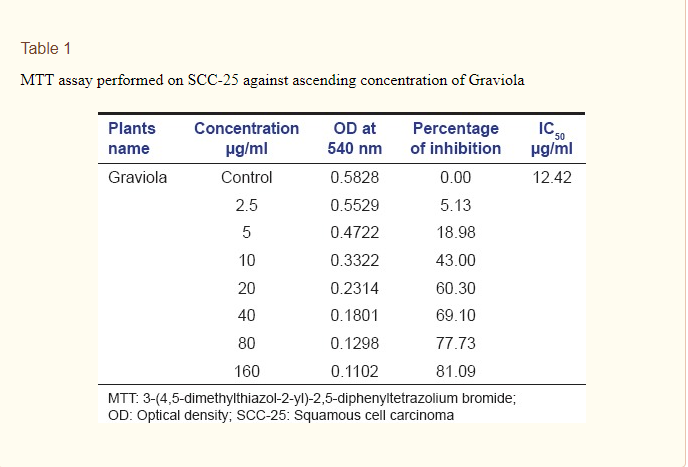 The aim of the study was to find out the effect of graviola leaves on SCC-25 squamous cell carcinoma cultures. It was a study on skin cancer cells. For the same, bromide assay and flow cytometry techniques were used. The outcomes of the study concluded that the aqueous extract of Graviola leaf shows promising cytotoxic activity and cell inhibition in G2M phase of cell cycle on SCC-25 cell lines. However, the study was unsure about the effect ofGraviolaa extracts on the normal cell line. The aim of the study was to evaluate the antiproliferative effects of the leaf extract on human BPH-1 cell cultures. This was an animal study. Twenty rats were gavaged different amounts of A.muricata extract and ten were taken as control groups. The best cytotoxicity effect was on IC50 of 1.36 mg/mL. The results were obtained immediately after two days. Bax gene was upregulated, while Bcl-2 was downregulated. Thus, it was that the guanabana extract has antiproliferative effects on BPH-1 cells. It can reduce the prostate size via apoptosis. The aim of this study was to figure out the in vitro anti-proliferative effects. It was also aimed to find out the apoptotic events of A. muricata extracts on HL-60 cells. Alongside, the phenolic components of the leaf extract were also accessed. MTT assay, membrane mitochondrial potential (MMP) and the cell cycle were the measures for apoptosis. 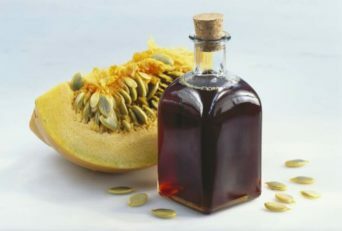 The results suggested that the concentration of phenols, flavonoid, and flavonols in the extracts were different depending on the part of the plant. Nevertheless, all the extracts from the different parts of the plant tested inhibited the proliferation of HL-60 cells. This was an in-vivo study done to evaluate the anti-tumor effect of Guanabana leaf extracts. The chemopreventive effects was studied in a two-stage model of skin papillomagenesis. It was found that the soursop leaves exhibited chemopreventive potential towards skin tumor growth in DMBA/croton oil induced papillomagenesis. The anti-cancer effect even existed at even at an extremely low dosage of 30mg/kg. However, further studies are required to confirm this anti-cancer mechanism. The aim was to study the potency of the Graviola plant as a therapeutic agent for pancreatic cancer. The metastatic PC cell lines FG/COLO357 and CD18/HPAF were used for the same. Several techniques like real-time PCR, western blot, cytotoxicity assay, apoptosis, necrosis, etc. was done to know the exact cytotoxicity level. The result indicated a progressive decrease in cell viability with the successive increase in the concentrations of the extract which suggested the potent ability of Graviola extract to kill cancer cells. 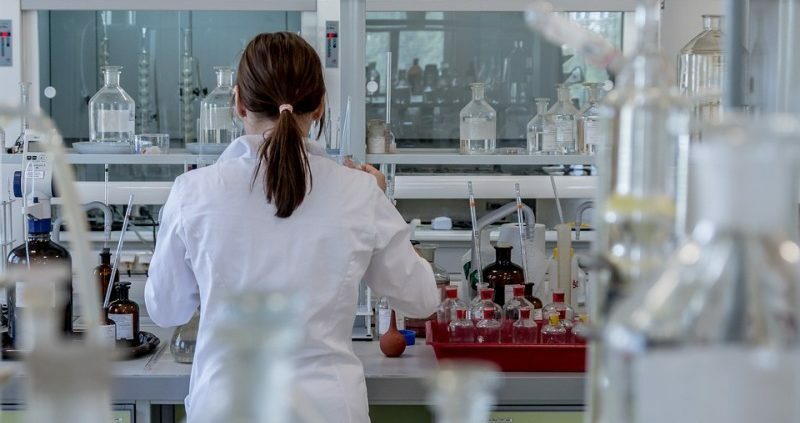 The Graviola compunds work by inhibiting the signlaling pathways that develop pancreatic cancer cells. The phytochemicals were subjected to toxicity analysis. Phytochemical compinds Anonaine, Friedelin, Isolaureline, Annonamine, Anomurine, Kaempferol, Asimilobine, Quercetin, Xylopine were clustered and the highly clustered compounds such as Annonamine, Kaempferol termed to be the potential constituents for study. Next,the extracted components were tested against the HeLa cell line and PC3 cell line. The study suggested that A.muricata shows 80% cell inhibition which suggest a high potency to kill the cancer causing cells. Graviola can cure cancer to a high extent, it is even proved in several animal studies. 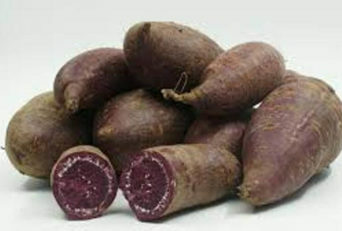 If you or your dear one suffer from cancer, you can definitely give this superfood a try. Moreover, you can even eat this fruit and enjoy its array of health benefits even if you are not a cancer patient. However, you should always consult a doctor before taking it as a cure for cancer especially if you are on medical treatment. 1. ↑ Reddy L, Odhav B, Bhoola KD. Natural products for cancer prevention: A global perspective. Pharmacol Ther. 2003;99:1–13. 2, 6. ↑ Rady I, Bloch MB, Chamcheu RN. et.al. Anticancer Properties of Graviola (Annona muricata): A Comprehensive Mechanistic Review. 2018. 3. ↑ Qazi AK, Siddiqui JA, Jahan R, Chaudhary S, Walker LA, Sayed Z, Jones DT, Batra SK, Macha MA. Emerging therapeutic potential of graviola and its constituents in cancers.2018. 4. ↑ Paul J, Gnanam R, Jayadeepa RM, Arul L. Anticancer activity on Graviola, an exciting medicinal plant extract vs various cancer cell lines and a detailed computational study on its potent anti-cancerous leads. Curr Top Med Chem. 2013;13:1666–73. 5. ↑ Orsollae N, Basae I, Govil JN, Singh VK, Govil JN, Arunahcalam C. Cancer chemoprevention by Propolis and its poly phenolic compounds in experimental manuals. Phytochem Pharmacol. 2007;III:55–117. 7. ↑ Indrawati L, Ascobat P, Bela B, Abdullah M, Surono IS. The effect of an Annona muricata leaf extract on nutritional status and cytotoxicity in colorectal cancer.2017. 8. ↑ Sun S, Liu J, Zhou N, Zhu W, Dou QP, Zhou K. Isolation of three new annonaceous acetogenins from Graviola fruit (Annona muricata) and their anti-proliferation on human prostate cancer cell PC-3. 2016. 9. ↑ Syed Najmuddin SU, Romli MF, Hamid M, Alitheen NB, Nik Abd Rahman NM. Anti-cancer effect of Annona Muricata Linn Leaves Crude Extract (AMCE) on breast cancer cell line. 2016. 10. ↑ Visveswaraiah Paranjyothi Magadi, Venkatadasappa Ravi, Anantharaju Arpitha,1Litha,Kikkerilakshminarayana Kumaraswamy, and Krishnappa Manjunath. Evaluation of cytotoxicity of aqueous extract of Graviola leaves on squamous cell carcinoma cell-25 cell lines by 3-(4,5-dimethylthiazol-2-Yl) -2,5-diphenyltetrazolium bromide assay and determination of percentage of cell inhibition at G2M phase of cell cycle by flow cytometry: An in vitro study. 2015. 11. ↑ Asare GA1, Afriyie D, Ngala RA, Abutiate H, Doku D, Mahmood SA, Rahman H. Antiproliferative activity of aqueous leaf extract of Annona muricata L. on the prostate, BPH-1 cells, and some target genes. 2015. 12. ↑ Pieme CA1, Kumar SG, Dongmo MS, Moukette BM, Boyoum FF, Ngogang JY, Saxena AK. Antiproliferative activity and induction of apoptosis by Annona muricata (Annonaceae) extract on human cancer cells. 2014. 13. ↑ Hamizah S, Roslida AH, Fezah O, Tan KL, Tor YS, Tan CI. Chemopreventive potential of Annona muricata L leaves on chemically-induced skin papillomagenesis in mice. 2012. 14. ↑ María P. Torres, Satyanarayana Rachagani,Vinee Purohit, et.al. 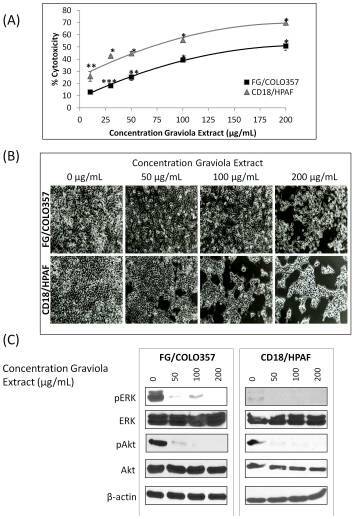 Graviola: A Novel Promising Natural-Derived Drug That Inhibits Tumorigenicity and Metastasis of Pancreatic Cancer Cells. 2012. 15. ↑ Paul J, Gnanam R, Jayadeepa RM, Arul L.Anticancer activity on Graviola, an exciting medicinal plant extract vs various cancer cell lines and a detailed computational study on its potent anti-cancerous leads. 2013.